Maurice Kirk, 73, has an appeal hearing coming up at the RCJ, but the latest docs. 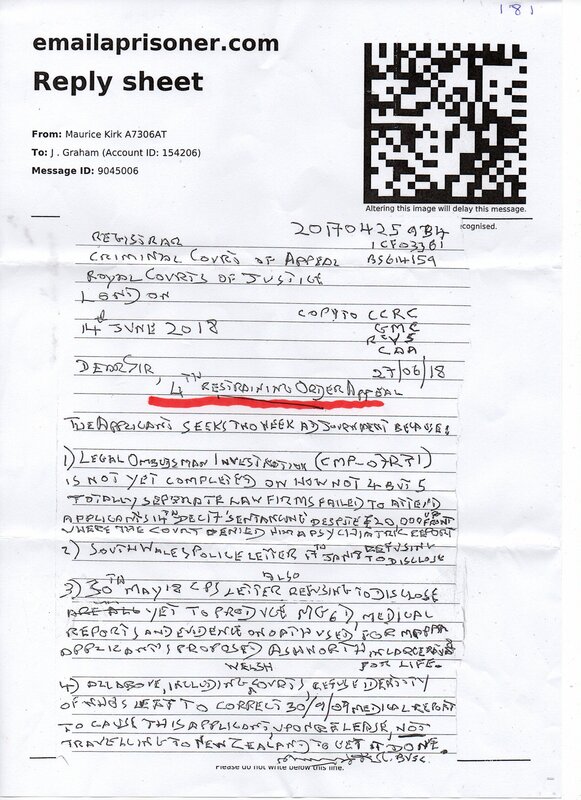 received today tell that he is unfit to take part in the hearing due to medical issues [regarding also a newly reported “tooth abcess” occurring] or by video link either, and is seeking an adjournment. 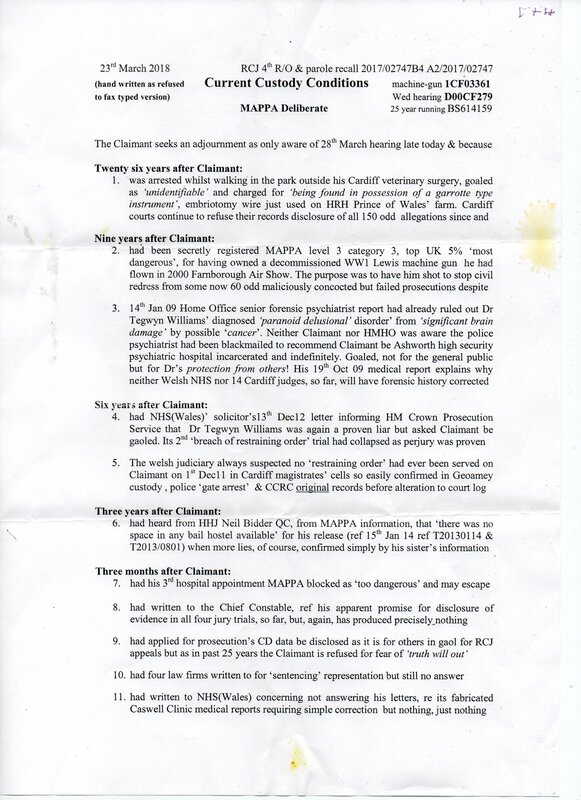 Also documents are being refused that M wishes to show at the hearing, as detailed in the notes received, below. 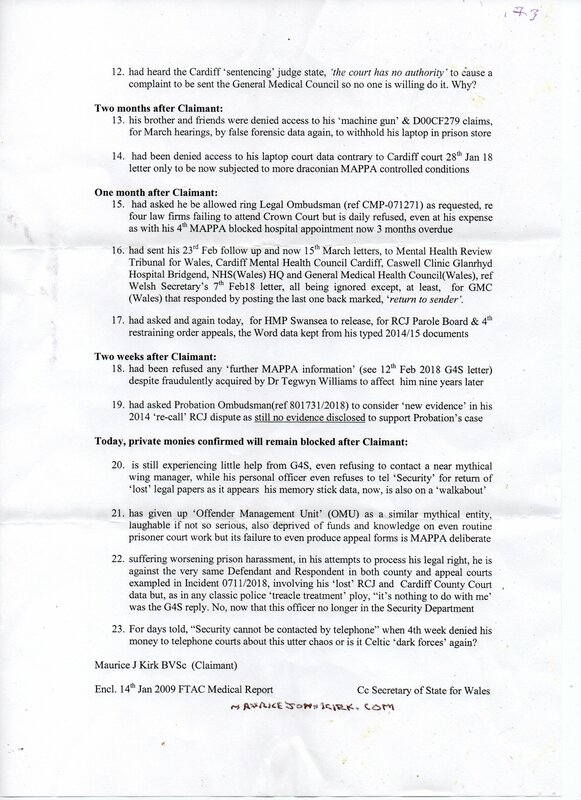 Medical treatment, including the preplanned hospital appointments for his “torn stomach diaphragm” have been denied Maurice, using various excuses, as well as painkillers being denied also on numerous occasions [at least once using the hilarious excuse that the drugs MK is being prescribed have been “lost” – in a prison!]. 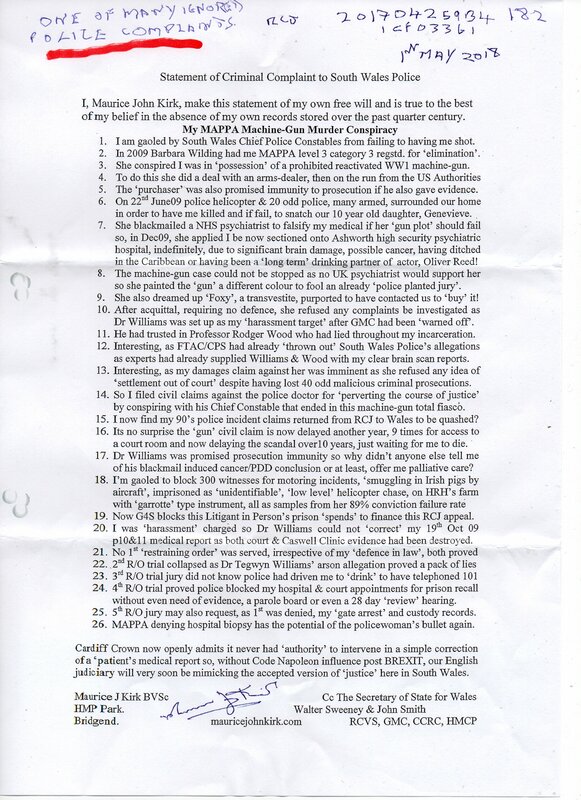 Suffice to say that since 2009 Maurice has been forced to spend at least 7 years behind bars – most, if not all of these sentences [or remands in custody also] based on the premise that MK breached a restraining order – a restraining order that was never served upon MK in the first place according to UK law. 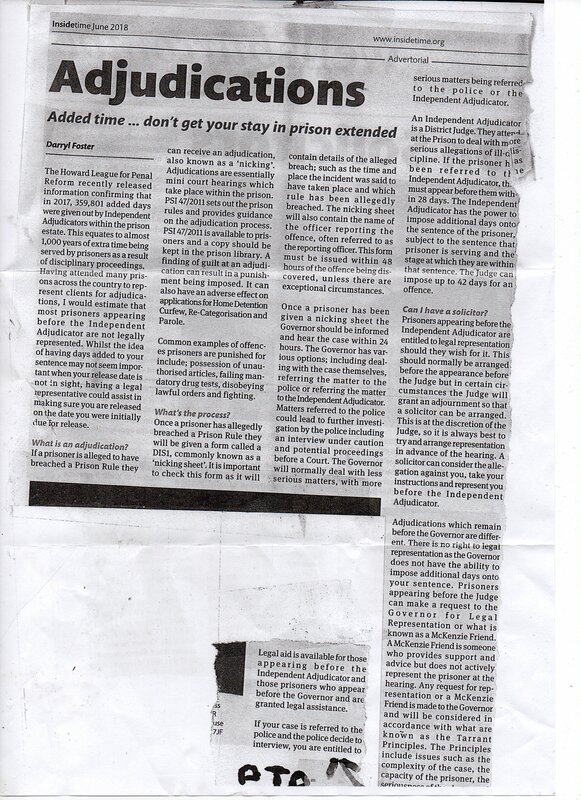 The gobernment has compounded this irregularity by not only failing to show the original restraining order [that government personnel attempted to serve upon him by forcing it into MK’s sock whilst he was lain prone on the ground outside a prison cell, accompanied by various prison officers in 2009], but also has manufactured more than one “variation” of this [alleged] original order. How can a “variation” of an order be legal if the original cannot be shown, or, more importantly was never served according to UK law on Maurice in the first place? 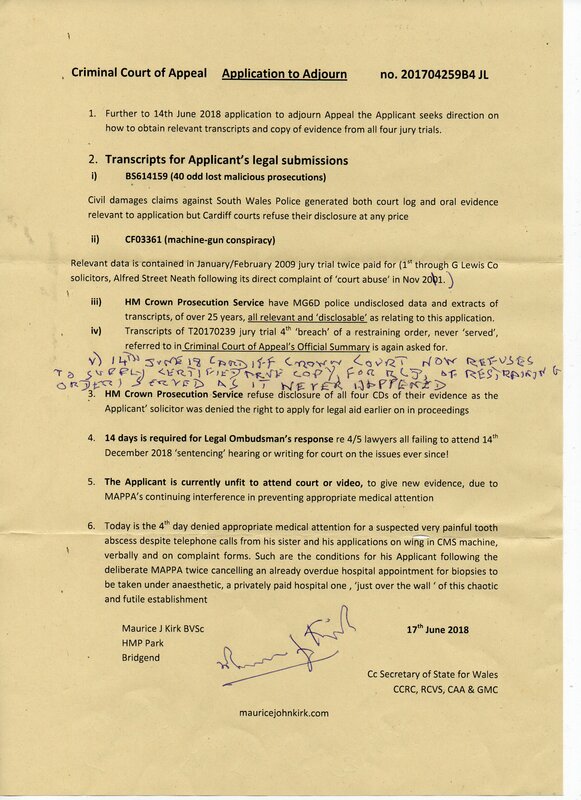 The order relating to MK being restricted regarding contact etc. 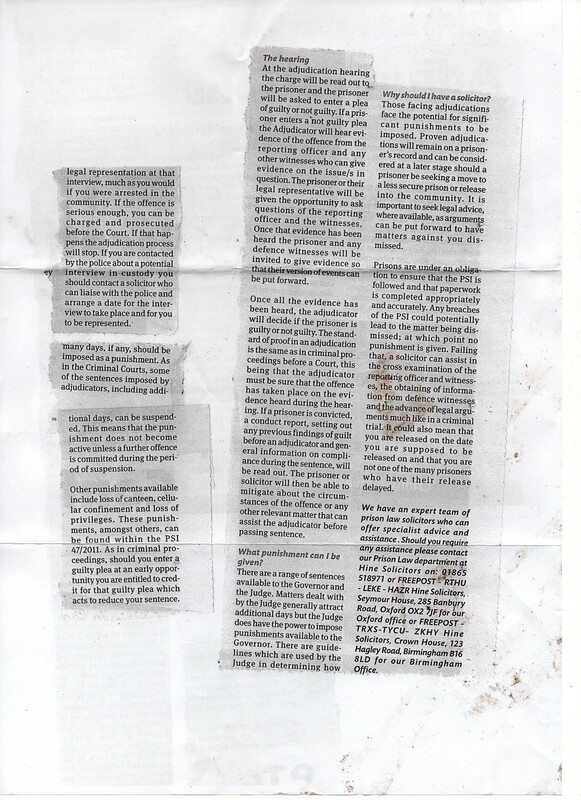 with the doctor who left the NHS after manufacturing a report that MK had a “brain tumour” and was therefore unfit to be in society due to the ailment’s implications and therefore MK should be removed from society for the good of all and be placed in a closed mental unit, such as Ashworth or Broadmoor forever. 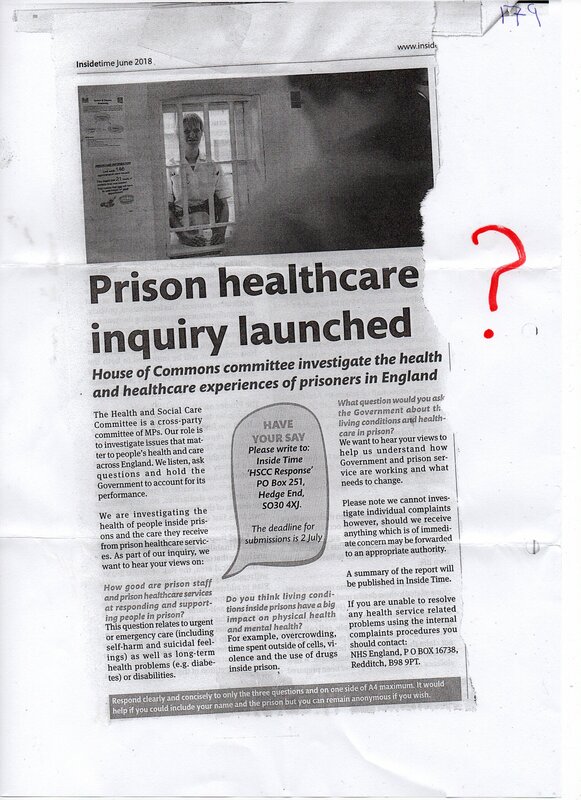 This report was found to be completely without merit as official medical tests and brain scans later proved that Mk had no tumour – those reports taking years – and a hunger strike – to get. 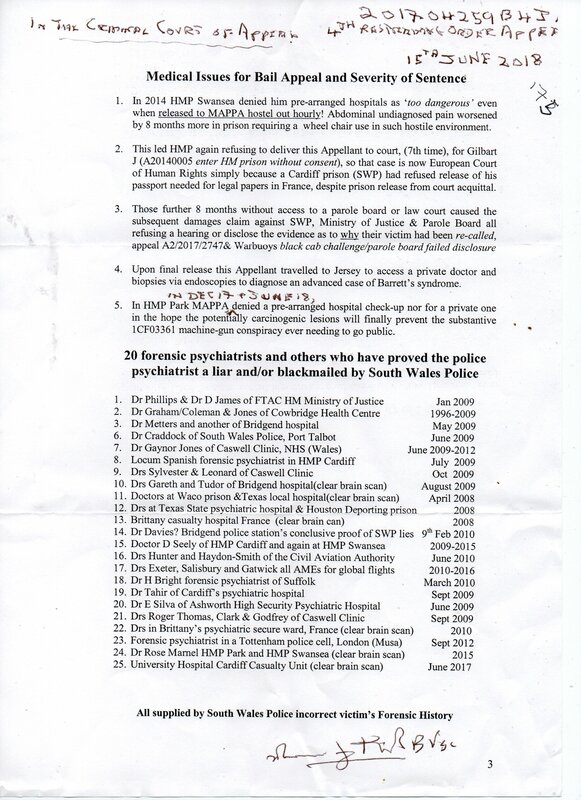 The bottom line is: having to serve at least 7 years out of 9 in a hellhole prison [with even basic medical care denied 99% of the time] as has happened since 2009 to Maurice [perhaps to interfere with his 40 odd cases against the S. Wales police etc.] is a horrific punishment torture to bestow on anyone especially if the restraining order wasn’t served properly on it’s recipient the first place.